Pretty good description of faith. There’s a place we hike to that has a rope bridge to cross a wild Alaska river. The first time we hiked there, it was shrouded in fog and we had to make a choice. Trust that the bridge was connected on the other side, even though we could not see it or wait for the fog to clear. Faith is not a leap into the dark as the modern philosophers would have us believe. 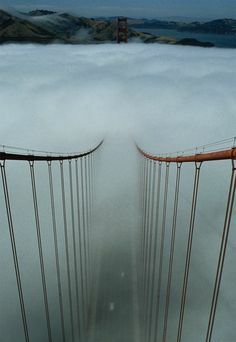 It’s a step onto a fog-shrouded bridge. We are not given definitive proof that God exists, that Jesus is God, that if we trust Him He will save us. We’re given hints — small bits of evidence that we can either follow to the bridge or ignore. Cannot prove? Well, that is what some say. Others view the issue differently. God falls outside the realm of science, but we can still apply logic and reason. Still, there is a problem. How do we prove something to someone who refuses to accept any proof? What if we have proof? What if the real problem is that some people refuse to believe? Just read the comments on Jack appreciates my help, leading to a visit from Tony. Both seem extremely well read and articulate. Tony was trying to show you something you didn’t want to see. It’s obvious that he was the better prepared for the discussion. I am pleased you find my older posts interesting enough to read. I really am. Nevertheless, I am puzzled. What am I supposed to get out of your comment? You are entitled to your opinion, but what is the point? Are your trying to change my mind? How? Just as the mere fact I disagree with you is not sufficient cause for you to change your mind, I do not see sufficient cause the mere fact that you disagree with me to change my mind. A comment is not always an argument or an attempt to change a mind. It was just a comment. I read pretty widely and I like or comment on many posts and blogs that I may overall disagree with. Feedback brother, feedback is always good for anyone putting something out there. I’m just giving some feedback. So defensive. Defensive? I suppose so, but mostly just puzzled. Is feedback is always good? Nope. 1. (in an audio system, especially a public-address system) the feedback of sound from a loudspeaker to a microphone, often resulting in a whistling noise caused by electrical oscillations. Some feedback just results in noise. What I offered in reply to your comment was feedback. Effectively, I asked you to be more specific. Going out your way to tell someone you disagree with them is how you wish them a great day? How curious! Well, the same to you. I actually agreed with the ‘no leap’ idea. Faith is more of a conscious choice ‘step’ one makes past evidence, both lacking and to the contrary. The issue is not a lack of evidence or contrary evidence. The problem has to do with the nature of the evidence. The problem has to do with whether we wish to believe. We exercise faith every day. Because we never know the outcome for certain, we have to put our faith in our abilities, our tools, other people, institutions,….. When I was in Colorado, my family and I visited a place called Royal Gorge. Crossing the gorge stood a suspension bridge over a stream that flowed 800 feet below. Most people were willing to step out onto the bridge as it swayed gently in the wind. It was a old bridge, just a tourist attraction sometimes used by bungee jumpers. Nevertheless, it was in good repair. Yet some are afraid of heights, and many of these could not and would not put their faith in the bridge. The evidence? It was right there before them. Didn’t make a difference. Those who did step onto the bridge, however, grew more comfortable in their faith the longer they put their trust in the bridge. In my opinion, the leap would be easier if travelers would lighten up their backpacks with worldly goods and insert wisdom to help lift the fog, and love to motivate courage and meaning to help will them along their crossing.